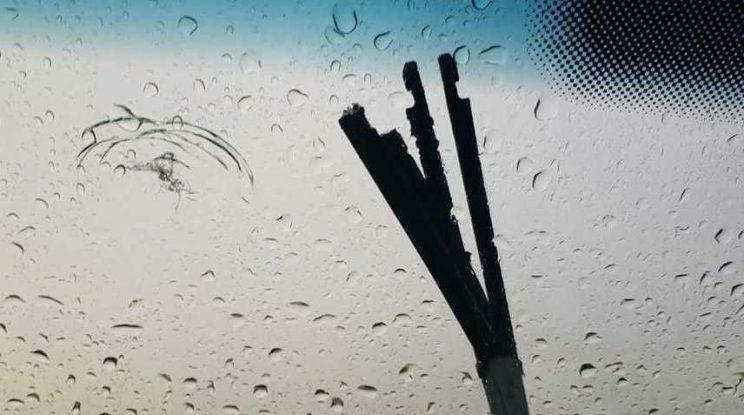 The wiper blade was ripped apart by a lightning bolt. 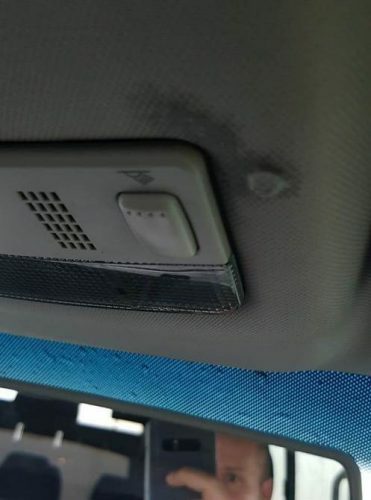 A lightning bolt struck the wiper and surged through the car, damaging electrical components and drilling a hole into the windscreen. If you have wondered if lightning can strike a moving vehicle, 30-year-old lightning strike survivor Org Wasserman has the answer. “Yes, it definitely can!” exclaimed Wasserman while pointing at the windscreen wiper on his wife’s car. Lightning struck the Volkswagen T5 Combi early on Monday, reports Ridge Times. Petricia Wasserman’s vehicle was closest to the gate that morning, and her husband decided to drive it to his work at Impumelelo Mine near Greylingstad in Mpumalanga. Close to Leeuwpan on the R50, lighting struck the combi as Wasserman was overtaking another vehicle. “I heard a loud thump and then saw sparks flying as the lightning fried the wiper blade. “All the lights in the car came on at first and then all went dead,” Wasserman explained. 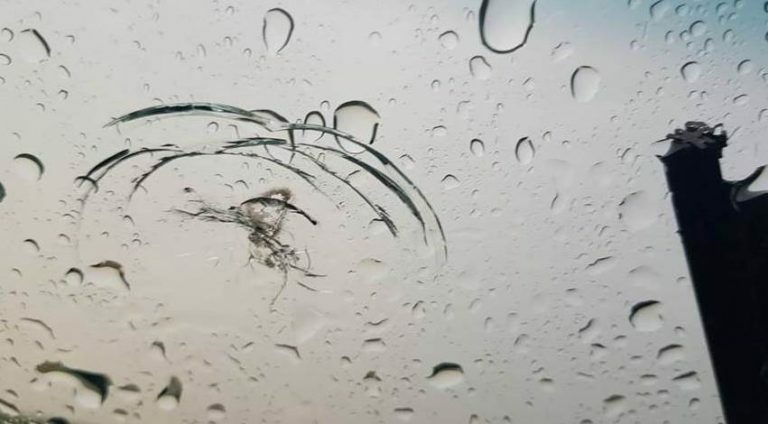 The lightning pierced a hole through the windscreen of Petricia Wasserman’a car. Wasserman was forced to veer the slowing vehicle off the road. Wasserman admitted that he was too scared to climb out of the car to inspect the damage, as the weather was in turmoil at the time, with rain and flashes of lightning in the sky. He eventually phoned Sectri Autobody and the vehicle insurance company once he made sure his phone was still usable. It appears that a lightning bolt struck the wiper and then surged through the car. The current left a tiny hole in the windscreen and burned marks on the inside of the roof near the rearview mirror. Wasserman suspects that all the electrical components in the car have been damaged. “It is completely dead. We are still waiting for a quotation on the damage. If it is too high, the insurance might consider to scrap the vehicle,” explained Mr Wasserman. He now also has another dilemma – all the cards in his wallet that contain microchips have malfunctioned because of the electric current that passed through the vehicle. Petricia said she was just thankful that her husband and the father of their two young daughters was safe. Wasserman is curious to know what the driver of the vehicle he was overtaking saw in that moment. “He was driving a sea green Volvo S40, but I did not see a number plate,” said Wasserman. According to the website weather.com, it is a mere myth that vehicles provide protection from lightning due to the rubber tires. An article on the website explains that lightning flows around the outside of a car, and the majority of the current flows from the car’s metal cage into the ground below. The flow is interrupted where a car does not have a metal roof, or if some parts are non-metal. Some portions of the current can also flow through the vehicle’s electrical system and metal appendages including radios, cell phone chargers, GPS units as well as car door handles, foot pedals, the steering column and the steering wheel. Org Wasserman takes a cellphone photo inside the combi. The mark on the roof was caused by a lightning strike. According to the American National Lightning Safety Institute, some vehicles struck by lightning experience external damage, including pitting and arcing, as well as internal damage to electronic systems and components. It suggests that if a person cannot find a more substantial shelter in a sturdy building, a metal-topped vehicle can keep you safe in the event of a lightning strike. “If you are driving, pull to the side of the road, turn on your hazard lights, turn off the engine and wait out the storm. Fold your hands in your lap and avoid touching anything metal within the car. “You also should not to touch the radio or talk on a cell phone, especially if it is connected to your vehicle.